Last week Mama (the célèbre) chose ‘Amazing Grace’ for us to watch on her birthday. As always, the true story of William Wilberforce’s tremendous efforts to end the slave trade in the late 18th century is SO VERY INSPIRATIONAL. At that time the British Empire stretched from India to the West Indies, where many British leaders made their fortunes on the backs of slaves taken from Africa. The whole economic system in England benefited from cheap slave labor with the slave trade entrenched in all levels of society. There’s something in this movie for everyone: Taking on the establishment (Wilberforce must take on 200 MPs lining their pockets with the slave rrade); a love story (after submitting his bill again & again to Parliament & failing again & again, Wilber’s a bit worn out & needs something?! ); drama (opium addictions & House of Parliament shenanigans inclusive); creative politicking (Lord Charles Fox asks PM Pitt to ‘play cards’ for Wilberforce); faith (Wilber has a conversion experience that drives his desire to transform society); friendship (Wilberforce & William Pitt the Younger); and so much more. This movie also serves as an excellent example of what goes into an Advocacy Campaign. I’ve used it several times teaching an Advocacy Strategy course to university students (they didn’t seem to mind the evening session.) Because, it’s all there – including the personal sacrifice & long-term commitment often required before things change. In the film, John Newton tells Wilberforce: “God sometimes does His work with gentle drizzle, not storms. Drip. Drip. Drip.” That’s often how advocacy works as each one of us in our respective spheres of influence seeks to influence change, one drop in the bucket at a time. An outstanding cast delivers truly stellar performances: Welsh actor Ioan Gruffudd as Wilberforce, Benedict Cumberbatch as PM Pitt the Younger, Rufus Sewell as Thomas Clarkson, West African singer Youssou N’Dour as freed slave activist Olaudah Equiano, Romola Garai as Wilber’s wife-to-be Barbara Spooner, Ciaran Hinds as the opposition leader Lord Tarleton, with celebrated actors Michael Gambon as Lord Fox and Albert Finney as Wilber’s teacher & former slave trader, John Newton. This entry was posted in Advocacy Issues, Lent, MOVIES !! 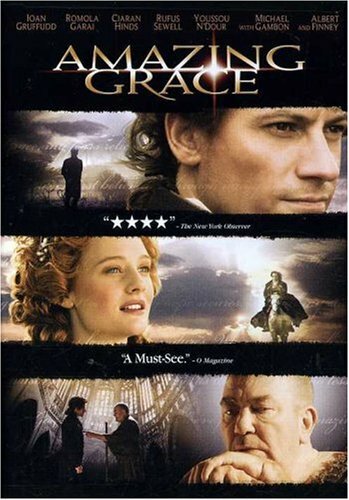 and tagged Abolition of the Slave Trade, Advocacy campaigns, Africa, Amazing Grace, Amazing Grace the movie, Drama, Faith in Action, Human Rights, inspirational movies, Ioan Gruffudd, John Newton, politics, slavery, Social justice, William Pitt the Younger, William Wilberforce. Bookmark the permalink.